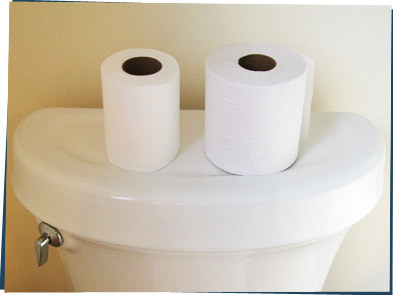 Today we're talking about toilet paper. Izz are you sure people want to hear about that? Maybe we should leave it in the bathroom. No, Dex. People need to know about it. Toilet paper can easily be made from recycled paper but Americans don't like to use that. They like their toilet paper bright white and fluffy as a cloud. And you can only fluff toilet paper that's made from directly from trees. Hmm, but what are you expecting us to do? Wipe with sandpaper? Or cardboard? Toilet tissue made from recycled paper is totally fine! Just slightly less soft than we're used to. But people in Europe and lots of other countries use it every day, no big deal. Can you even tell which is which in the picture? That's what I thought. So next time you reach for a roll, think about what forest that paper came from!